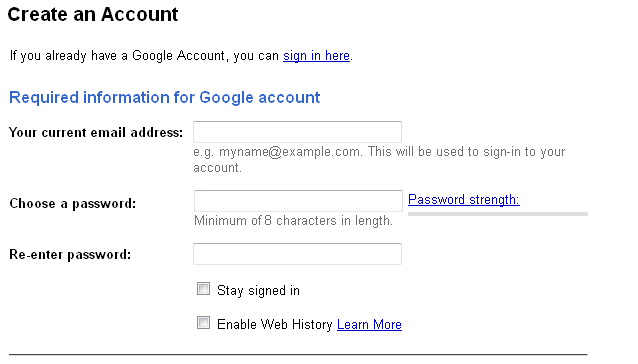 Google appears to have made some changes to its account creation process. Whereas before, all it took was an email address of any kind and some basic demographic data, now you are required to create both a Gmail account and a presence on Google+. This doesn’t strike me as a user-friendly change. On one hand, it’s harmless in a way: you create a throwaway email address and a dummy G+ account if you don’t want to use them. Problem solved. But is that really a step people should have to take if they just want to use Google Docs or YouTube? Certainly Google will say that this is all about the integration of services, but part of the attraction of Google services has always been how you can just use one or the other. This forced-signup device smells of an attempt to boost G+ numbers, and is reminiscent not of the Google of yore, but of the Apple and Facebook of today. Some services haven’t yet updated their account creation pages, and at the moment you can use this URL to go straight to the old account creation screen. It seems doubtful that this loophole will remain open for long. Not only will this lead to the creation of many derelict G+ and Gmail accounts, but people who are not interested in G+ and have not cared to educate themselves on it may be bothered by the notifications, circlings, and other features they didn’t ask for. I know that G+ is the new glue holding Google’s services together, but it’s a little early to be forcing it down people’s throats, don’t you think? And note that in the G+ sign-up screen, it is not explicitly mentioned that you are “joining Google+,” though that is clearly what you are doing. Instead, you “create your Google profile. It’s how you represent yourself publicly on the web.” Then, seemingly apropos of nothing, it describes Google+, again without saying you’re joining it. Is this a mere technical bugaboo that most people will not care about? Maybe. But Google’s definition and application of G+ is already nebulous enough without this deliberately vague initiation. Google can’t be afraid people aren’t engaging with its products, Gmail included. Google+ perhaps, though it’s still new and fairly unformed. But why this clumsy, user-unfriendly solution? Why not just ask if people want to create an account? Or if a Google+ account is just the sharing features of your Google account, why not be straightforward about it?